Pictured, Oregon state lawmaker, Rep. Janelle Byrun (along with police officer who was called after she was observed in the neighborhood). Pictured, Oregon state lawmaker, Rep. Janelle Bynum (along with police officer who was called after she was observed in the neighborhood). 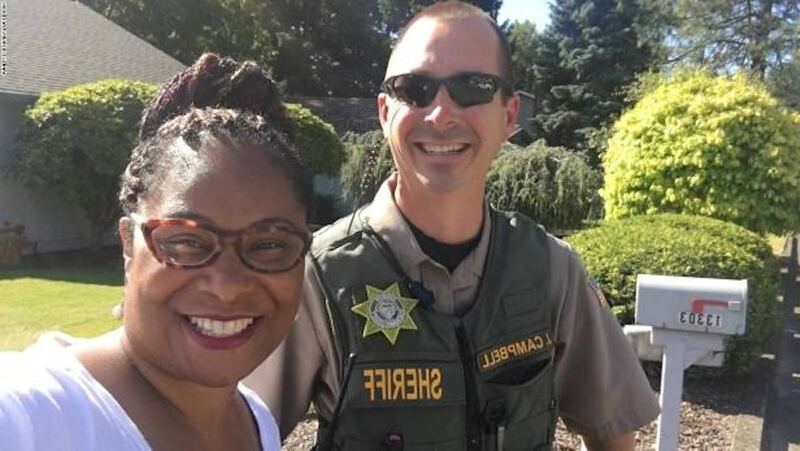 Rep. Janelle Bynum a black Oregon lawmaker has police called on her while campaigning in her own district after the color of her skin alarmed a voter. Or did it? An Oregon state lawmaker has told of one of her constituents calling cops on her while knocking on doors in a bid to meet prospective voters. ‘I don’t believe this,’ Bynum told The Oregonian after spotting the deputy in his cruiser. Bynum, 43, said he asked if she was selling door-to-door. The politician who’d already being out two hours that morning campaigning said she was a state legislator trying to canvass constituents. The deputy said somebody called 911 to say she appeared to be lingering around homes and feared she was casing the neighborhood. Rep. Janelle Bynum: Does it really boil down to people not knowing their neighbors or indoctrinated racism? Responding to the affront, Bynum called the incident, ‘just bizarre’ (which is a kind of way of ignoring that this wasn’t racial profiling or racially motivated…. or was it?). A sense of fear which goes up in some people’s minds if your skin happens to be black, brown and four shades to the right of peachy white. From there, Bynum recalled asking the deputy to reach out to the caller, who in turn got the female caller on the phone. The lawmaker said the woman apologized and said she called 911 to protect the neighborhood. Bynum later posted a photo of her and the deputy on her Facebook page and praised him for his professionalism. A professionalism which these days sees a disproportionate about of blacks and browns manhandled, shot in the back and incarcerated at the hands of police. Which is to wonder, what exactly does Rep. Janelle Byrun’s community care about and are they willing to trust her to protect her from the very thing they fear? What on earth has happened to our country? Oh, wait……Trumpism. Looks that officer has the right frame of mind about this absurdity. Thanks to Janelle Bynum for your service in our government! I hope this makes people think more about their fears and why they really need to call the cops.